Intelligence is a wonderful quality. It means your dog will learn quickly and retain what he's learned. He will be the star of your obedience class. English Shepherds are alert, active learners - willing to cooperate when you express an opinion, but also continually trying to figure things out for themselves. Intelligence, though, is not trouble-free. Intelligence can be dangerous when it is combined with boredom. Give some thought as to how your dog's mental ability can be constructively applied. Without your input, your dog will apply his considerable brain power to accomplishing those tasks that are important or rewarding to him. Chasing cars or bicyclists, guarding your street against the mailman, and rummaging through your garbage - which may include toxic chemicals, bone shards, and other lethal items - are all strangely motivating activities to a bored dog. Keep your dog, and your home, safe; give your English Shepherd a job to do. Many people remark at how shy an English Shepherd may appear. A better description would be an English Shepherd is reserved. They will hold themselves back until they make up their mind about a newcomer. Once they have accepted someone they will show their love and devotion with abandon. Most English Shepherds do not tend to stray or wander away from the home. Since very few fences are tall enough to contain a motivated English Shepherd, this commitment to hearth and home is a useful trait. Particularly in a home with small children, or other unreliable family members, knowing your dog is unlikely to bolt if the gate gets left open is reassuring. Unfortunately, you may find meter readers, delivery persons, and unexpected guests trapped in their vehicles in your driveway. An English Shepherd should never be aggressive (bite) without provocation, however he may demand that unfamiliar visitors "halt!" until you say otherwise. Early socialization of your English Shepherd puppy is critical for developing his ability to judge who and what poses a real threat and learning how to respond appropriately. 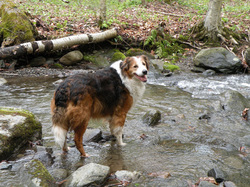 English Shepherd owners, particularly those in urban areas, must be willing to provide that socialization. As far as your English Shepherd is concerned, you are the center of the universe. A desire to be with you is fundamental to his character: if you are typing on the computer, your English Shepherd will be under the desk; if you are taking a shower, he will be lying on the bathroom floor; if you are working on the farm, he will do his best to help out - whether that means dragging branches to the woodpile, or moving sheep between pastures. This devotion is so intrinsic to the breed, many owners refer to their dogs as "English Shadows". Not everyone wants a dog that needs to be your partner and companion. Some people may find it annoying or even irritating. These people should consider a different breed (or species)! Notice the word choice here - bossy, not "dominant". There is a difference, though it can be difficult to grasp at first. Perhaps the easiest way to think about it is that dominant dogs care about status (social position), bossy English Shepherds care about the status quo (social order). Rather like your Aunt Sally, who can not help straightening up your books and wiping off the counter tops when she visits, a typical English Shepherd has a strong internal sense of How Things Should Be, and will work very hard to create and maintain that order wherever they go. They can become furry control freaks, insisting that everyone - and particularly other dogs - obey the Rules. If you turn a well-socialized English Shepherd loose in a typical off-leash dog park, you might as well give him a little striped jersey and whistle at the same time, because he will immediately assume the role of referee. If your particular English Shepherd has a dominant personality, he will probably act as an Enforcer. Dogs that are playing too rough, being rude or pushy, running too fast or barking too loud will be put back in line. If your English Shepherd has a softer, more submissive personality, he may act as an Informer, alerting you - the Pack Leader - to rule violations . This can be distressing to owners whose ideal dog is the stereotypical Golden Retriever: a dog that plays well with others and gets along with everyone. English Shepherds benefit from playing with other dogs, and most have a select group of canine buddies that they would run with for hours (often from other herding breeds). They are not canine extroverts, however, nor are they perennial puppies. Once they have matured, usually by age 2, their demeanor is characterized by seriousness of purpose and regard for order. This quality deserves respect. It is what drives a working English Shepherd to put the cows back in their pasture at night when the fence breaks. It is what causes your family pet to steer little Anna back to the house after she discovers how to open the front door. It is what saves you many hours of training with your second dog- you can rely on your perfectly trained and totally devoted English Shepherd to teach the young heathen how to sit for meals, wait at doorways, and come when called. Don't believe it? Just wait! Height ranges from 19 - 24", weight from approximately 40 - 70 lbs. The exact size, however, is less important than physical soundness and ability: English Shepherds should be balanced, athletic, and hardy dogs, with impressive stamina and agility. These qualities are most compatible with moderate size. Most English Shepherds also have a moderate build, neither lean and rangy nor broad and stocky. Individual lines may tend more in one direction than the other however, and this variation is acceptable as long as the dogs retain the ability to perform the work expected. English Shepherds have a deep, wide chest, a level back, and are generally slightly longer than tall, in contrast to the more "square" appearing Australian Shepherd. There is considerable variation in ear set and tail carriage. Natural bobtails are whelped occasionally. English Shepherds have a double coat, with a soft dense undercoat and a silky outer coat. The silky texture gives the coat a weatherproof "teflon" quality which owners appreciate: matts and tangles are uncommon, and dirt falls out leaving the coat clean -- but your floor dirty - without the need for frequent baths. Many dogs shed heavily twice a year while blowing their undercoat. Apart from these seasonal sheds, grooming requirements are minimal. Color and markings are among the most striking physical features of any dog, however their importance should not be over-emphasized. There is no consistent relationship between markings and either health or temperament in English Shepherds as a breed. English Shepherds come in four main color patterns: black and white, black and tan, sable and white, and tri-color. Other colors, including red ("liver") and yellow ("clear sable"), also occur; the merle pattern found in many herding breeds is not found in English Shepherds. Text and photos on this website may not be copied or reproduced without permission. Copyright English Shepherd Club Inc. 2012 - present.